Catalonia is small area on the world map, a little country, but it has an incredibly diverse geography and great wines in every quality wine producing region, all of them different and with special characteristics than make the wine different and particular to that area. Priorat is a small area in Catalonia, a county where two different Designations of Origin coexist: Priorat and Montsant, really very close but different. A key aspect is the soil: the basis of the Priorat soil is the slate (called llicorella in Catalan) with traces of mica and the steep slopes. The main consequence is that the roots of the vines need to reach the ground-water table because the slate doesn’t retain the water. In this region, the vineyards are at different altitudes, from the 200 m the lowest point up to 750 m above the sea level in places like Porrera, which can make a big difference between the vines and grapes. Also, the climate is important: summer is a long season, hot and dry with great contrasts of temperature, which can change from the 35-40ºC during the day to the 15ºC or less at night. The winter is really cold in this area. So, the soil, the height and the climate determine a charming landscape which captivates you. The result of all these distinguishing marks are young wines, deeply coloured, brilliant with persistent and serene aromas and on the palate are chewy and full-bodied, with a long aftertaste. Often these wines have a high alcohol content (between 14% and 15% abv), but with a well integrated tannins and very well balanced. The criança and reserve wines are aged in oak barrels smoothing away any aggressive notes due to their youth. In this way, they obtain a complexity that only can be perceived through taste and smell. In the Priorat Designation of Origin you can find different kinds of wines depending on where are they from: Single State Vineyard and vi de vila that we can translate as “wine of the village” because the difference between villages (specially their geography and soil) make a big difference to the wines). Both are precisions of some Priorat wines (in this video http://vimeo.com/23003431 Álvaro Palacios, Daphne Glorian and also René Barbier explain it very well... but in Spanish). I’ve been several times to Priorat, usually when I go to wine fairs, and with all my wine mad friends. 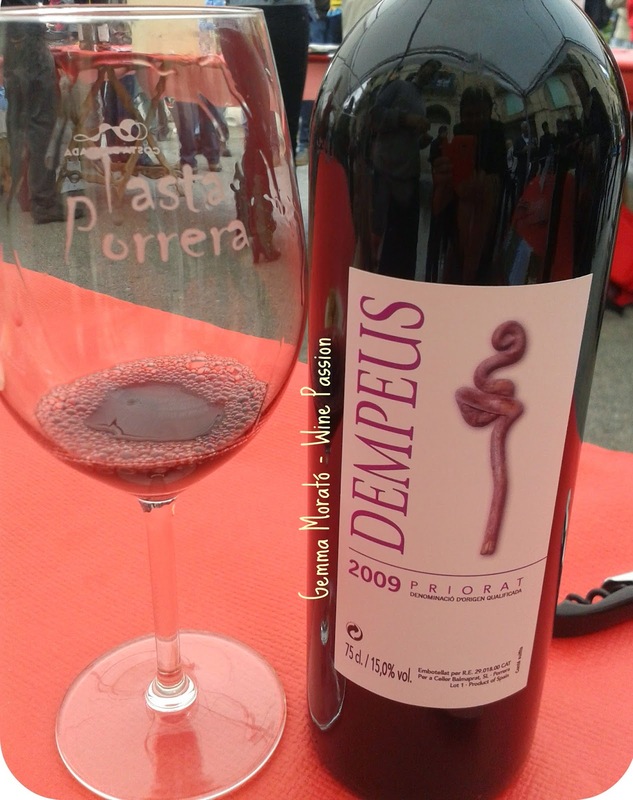 Often we taste a lot of wines, but I always discover new wines that I haven’t tasted before and one of these is Dempeus 2009, from Balmaprat cellar, a wine with 18 months in oak barrels and made with Carignan, Grenache and Cabernet mainly, and with a little bit of Merlot and Syrah. It’s a great wine to introduce you in Priorat wines. From Domaines Magrez Espagne we tasted two wines: Sine Nomine 2007 and Herència del Padrí 2006, both are blended wines with Carignan and Grenache mostly and little percentages of Syrah, Merlot and Cabernet. These wines are very similar. They have been aging in new French oak barrels for 18 months. On the nose you can appreciate ripe red fruit and also on the palate, with a little bit of minerality typical from the slate soils from the Priorat region, especially in old vineyards as these (that are between 40 and 75 years old). Sometimes, the fame from the owners of the cellar precedes the fame of the wines. The owners are Gerard Depardieu and Bernat Magrez (from Château Pape Clément, in Bordeaux). Other of my favourite wineries is Clos Dominic. Two or three years ago I had the pleasure of visiting the vineyard and the cellar in winter. At first I thought that it wasn’t the best season to visit because when you go to the vineyards you only can see the vines that are hibernating, but in fact you can perceive better many other things such as the soils, the slopes, the difficulty of taking care of the vineyards, the big challenge that every harvest brings on these slate slopes … at the end it resulted in a very interesting visit. The wines that we tasted from Clos Dominic were Vinyes Baixes and Clos Petó. Vinyes Baixes 2009 is a red blend wine with Grenache, Carignan, Cabernet, Merlot and a little percentage of Red Piquepoul that has been aging in oak barrels during 16 months. In appearance it’s a clear wine, with glyceric legs and we can appreciate how the garnet colour has lost intensity; on the nose the toasted notes and the sweet spices (vanilla, chocolate) stand out from aging in oak barrels, also some herbal hints. On the palate it is a silky wine, with soft tannins and a medium+ acidity. The red ripe fruit is well integrated with the oak tinges and some mineral notes. It’s a well balanced wine. The other wine is Clos Petó 2011, a blend wine too made mostly with Carignan (50%) and Grenache, Cabernet Sauvignon and Merlot that has been aging for 12 moths in which the red ripe fruit stands out (on the nose and on the palate) with some minty and sweet spices hints. From Sangenís i Vaqué cellar we tasted Lo coster blanc 2012, the other white wine in the fair. It’s a blend wine made with white Grenache and Macabeu (a Catalan indigenous variety) and a 5% of other grape varieties. The grapes come from a 40 years old vineyard. The wine has been aging for 8 months and the wine is unfiltered and hasn’t been clarified. In appearance it’s not a hazy wine; on the nose it stands out ripe green fruit, apple, pear, quince… and toasted hints from the aging. On the palate it’s fleshy, well balanced. Dara 2008 has been aging for 12 months in oak barrels. With a garnet colour, we can perceive red fruit and spice hints on the nose and on the palate. Another cellar is Celler Joan Simó, which took the opportunity of presenting the new wine Viatge al Priorat (Journey to Priorat) made mostly with Grenache and with little percentages of Cabernet, Syrah and Carignan. The label is the imitation of the old train tickets and it’s very appropriate if we think of the name of the wine. The other wines of the cellar was Sentius 2008, with 15 months in oak barrels, and made with Grenache (55%), Syrah (25%), Cabernet (15%) and Merlot (5%) it’s a smooth and supple wine! And Les Eres 2008, a blend wine elaborated mainly with Carignan and Grenache, and some Cabernet and Red Piquepoul is a great wine that gives out ripe red fruit with mineral and toasted hints that you can taste on the palate. It has ripe tannins and it’s a full-bodied wine. From the winery Celler d’Encastell there were two wines: Roquers de Porrera 2010, with 16 months in oak barrel and made basically with Carignan and Grenache from old vineyards (between 70-90 years old), has a good intensity and the black and red ripe fruit stands out on the nose and on the palate and is well balanced. The other wine is Marge 2011, a blend wine with Grenache and Cabernet that has been aging for 8 months in which and it is pure black fruit, cooked with sweet spices and toasted hints from the barrel. Both wines have mineral tinges that remind us that they are Priorat wines. Another of the wines was Vinyes Velles 2011, from Ferrer Bobet cellar, a red wine made mostly with Carignan (70%) and some Grenache that has been aging for 15 months. It is fresh and velvety, with ripe red fruits aromas. 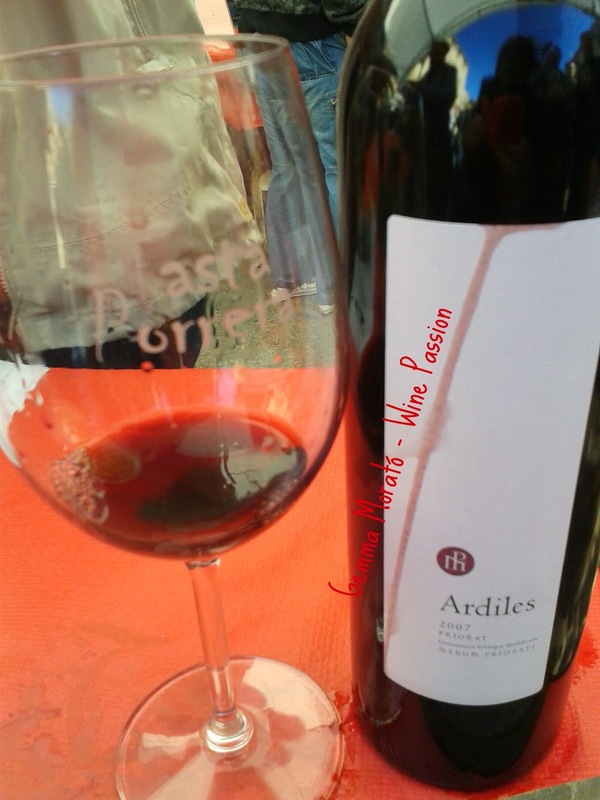 The last wine that we tasted in the fair was Ardiles 2007, from Merum Priorati winery, it’s a blend wine (made mainly with Grenache and Carignan and with some Syrah and Cabernet). The black fruit stands out with notes from the barrels as vanilla and tobacco, also herbal hints typical in the Mediterranean forest. Next November, more!! See you in Porrera!